There is nothing that stirs the senses quite like color. Consider how a sunny day affects your temperament, and why we are drawn to the color yellow when we want to create a cheery environment. Or how blues and greens are more restful colors, and red evokes feelings of passion, rage or danger. Color can alter our perceptions, making a small room appear larger and a big space more intimate. It serves as a reflection of personal taste and style. We are identified by color as individuals—just look at your driver’s license or passport. And conversely, we use color as a means of defining who we are, from changing hair color to choosing clothes that will make us look younger, slimmer and hipper. Don’t think that designers, marketers and advertisers haven’t realized the impact that color has on brand recognition and consumer purchasing. Just envision the purple and orange coloring of FedEx, the Starbucks green, the Coca Cola red and the golden arches of McDonald’s. They are recognized as much for their color as they are their logo design. 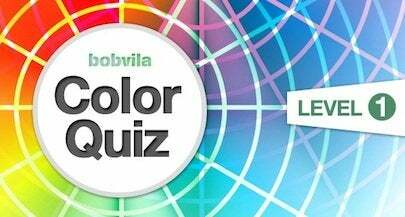 But there is more to color than meets the eye… and our color quiz is a fun way to test your overall knowledge. Go to Level One and see how you do!